According to Finnish national broadcaster YLE, Ikea started construction of its new store in Tornio-Haparanda yesterday (Monday, Aug 29). The bad news is that the store is now scheduled to open only at Christmas next year, not next summer as I had been led to believe. :( A spokesperson said that they expect one million visitors every year. Jesus, there are barely a million people in all of northern Sweden, Finland, and Norway combined. That said, I'm pretty sure every one of them will be visiting the Ikea store. Posted on August 30, 2005 by Scott Forrest and filed under Finland, Flat, North. Choose a poster for my bedroom! 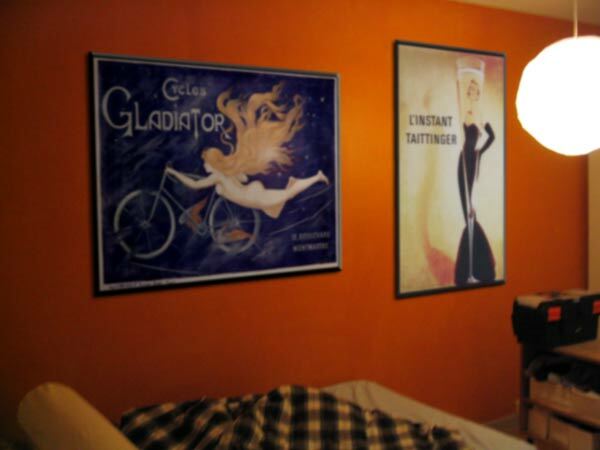 I used my fabulous Photoshop skills to see how some posters that I was thinking of buying from allposters.com would look in my bedroom. I'm still undecided, so I thought I would experiment with a web poll at the same time. Submit your vote below and we'll see which poster(s) I should buy. Posted on November 3, 2004 by Scott Forrest and filed under Flat. In the finest Fürni tradition, I've added some very versatile solutions for modern living to my flat. With my friend Marc, who needed to furnish his entire order, we split a truck order from Ikea. I kitted out with a new kitchen table & bench, divan couch, wall shelves for the "office", and other assorted sundries. I must say, I'm digging the renewed digs. Plus added incentive to actually keep it tidy. Thanks to the folks for the Christmas gift! More pics of the flat, in PhotoSpace. Posted on March 6, 2004 by Scott Forrest and filed under Flat. The continuing evolution of my apartment took a bold step forward with... colour! My walls are a very nice and neutral textured beige wallpaper. The bedroom has been the most unfinished part of "the pad," with nothing yet on the walls. What better way to change the look of the room than to splash some colour around. I decided a nice burnt orange would do the trick, and I think it looks rather good. Now I'm reluctant to put any of my old furniture in there. I may look for a new chest, or something to replace the easy chair that I never sit in. I think a couple nice vintage art prints on the walls would complement the new rough orange look, too. Any comments from the amateur (or professional) interior designers out there? Posted on December 14, 2003 by Scott Forrest and filed under Flat, Photos.